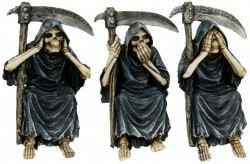 Three Grim Reaper figurines, See No Evil, Hear No Evil, Speak No Evil . Great for display on a shelf. Cast from solid resin for a stone statue effect and feel. Hear, speak and see no evil.